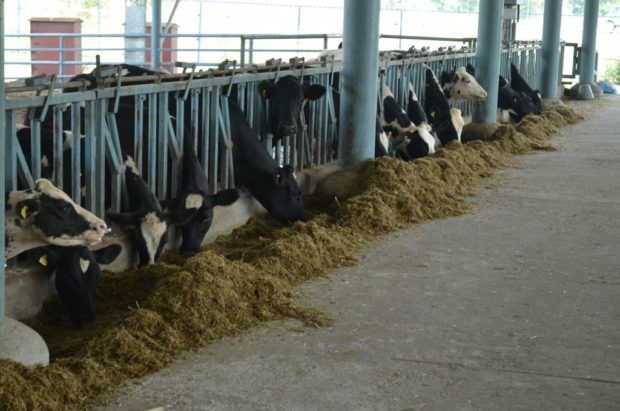 “Animals usually suffer from climate stress during April to October season which leads to fall in milk productivity, but if they are supported through climate-resilient sheds, farmers can recover the loss” said Dr J P S Gill, Director (Research), Guru Angad Dev Veterinary and Animal Sciences University (GADVASU). He was speaking to media persons who visited the campus to witness the Climate Resilient Livestock Production program on the second day of the three-day media workshop on climate change organized by the Centre for Media Studies and GIZ in collaboration with Punjab State Council for Science and Technology from September 25 – 27, 2018. Punjab has been one of the front runners in white revolution in the country. However, livestock productivity is at risk due to climate change and may have significant adverse impact on the livelihood of small and marginal farmers. Sustaining milk productivity under changing climate is a challenge, considering that performance of bovine stock is impacted by heat stress, more in case of cross bred cattle as compared to indigenous varieties. GADVASU which is implementing a Rs 17.39 crore five-year project for sustainable livestock production in collaboration with the Punjab Dairy Development Board, Department of Animal Husbandry, Climate Change and Agricultural Meteorology, Punjab Agricultural University, and Punjab Energy Development Agency. Three thousand families of small and marginal dairy farmers will be covered in three districts of Ludhiana, Tarn Taran and Bathinda. The project has various innovative and sustainable practices for integrating climate change adaptations in animal husbandry sector, which is a major contributor of state agriculture GDP. “Any decline in production over 10 per cent will be covered through insurance. This is the first time production-linked insurance will be provided. Till now, insurance is available only on mortality,” said Dr. Gill. Other components involved in the project include sustaining milk production, enhancing the pool of pure blood indigenous breeds, climate-proofing of cattle sheds, subsidy on green fodder and production-linked insurance. “Normally a decline in milk production is 15-20 per cent in adverse climate conditions but with climate-resilient sheds, the reduction will be 5-10 per cent,” said Dr Ravinder Singh Grewal, Senior Nutritionist, GADVASU. GADVASU is also developing a model on incidence of livestock diseases and change in temperature and humidity. “We have got 11 year data on weather and matching it with data on diseases from hospitals and government departments to see the relationship. This will be further used to formulate plans for livestock farmers,” said Dr Gill. Ranjeet Kaur, a resident of Kot Gangurai village, Ludhiana district who benefited from the project, said she had experienced a rise in milk production by one litre per buffalo.